Included is the PRO 67mm Wide Angle Lens w/ Macro + PRO 67mm 2 x Telephoto Lens KIT + 67mm-72mm Step-up ring the enable Capturing Extraordinary Photos and Videos with a Nikon 85mm f/1.8G, Nikon 70-200mm f/4G ED VR, Nikon 70-300mm f/4.5-5.6G IF-ED, NIKKOR 18-140mm f/3.5-5.6G ED VR, Canon EF-S 18-135mm f/3.5-5.6 IS / STM, Canon EF 35mm f/2 IS USM, Canon EF-S 10-18mm f/4.5-5.6 IS STM, Canon EF 100mm f/2.8L Macro IS USM and All 67mm Lenses and Cameras. 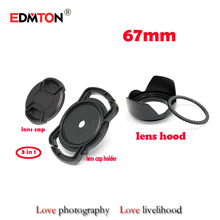 The 67mm 2 Lens Kit Includes a 67mm Super High Definition Wide Angle Lens with a Macro feature, this Lens can function either as a Wide Angle Lens, substantially increasing the camera view and enabling to capture Panoramic Photos + the Lens had a Macro Function that enable to get close up shoots for objects such as flowers, coins and insects + a 67mm 2x Telephoto Lens that enable to instantly zoom in on far shot by simply attaching the lens to the front of an existing lens, it's a great accessory for shooting long telephoto shots. Additionally included in the Lens Kit is a Lens Ring Adapter 67mm-72mm enabling to fit both the Wide Angle Lens and the 2x telephoto Lens on a variety of 67mm lenses + 2 lens pouches designed to protect the lenses from common damages such as scratches and water damage + a HeroFiber® Ultra gentle cleaning cloth designed for cleaning electronics and accessories. KIT INCLUDES 3 PRODUCTS -- All BRAND NEW Items with all Manufacturer-supplied Accessories + Full USA Warranties:. Sigma LCF-67 III 67mm Front Lens Cap +. PD 6pc Complete Cleaning Kit +. 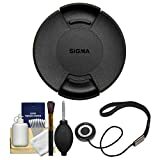 Kit includes:♦ 1) Sigma LCF-67 III 67mm Front Lens Cap♦ 2) Precision Design 6-Piece Camera & Lens Cleaning Kit♦ 3) CapKeeper 2The Sigma LCF-67 III is a Front Lens Cap for lenses that have a 67mm filter diameter. It protects the front element from dust, smudges and scratches.This 6-piece cleaning kit contains everything you'll ever need to properly clean your lenses, including a Hurricane Air Blower, Lens Cleaning Tissues, Lens Cloth, Lens Cleaning Liquid, Brush and Cotton Swabs.Keep your lens cap securely attached to your lens with the convenient, simple-to-use CapKeeper. Never lose a lens cap again! Ever take a picture and couldn't fit the whole family in the picture? Wonder how professional photographers get an entire sports arena in a picture? Well not any more! Create beautiful images with this 0.5x Wide angle Lens for digital cameras and camcorders. The 0.5x lens will widen the image area view twice as much, giving you the opportunity to create great images without moving away from your subject. The wide angle lens widens the angle of view by multiplying the focal length of the camera lens by 0.50 times. This doubles the angle of view making it an excellent lens for group shots or architecture. Improve the image composition of scenic views, and interior shots, especially when movement is restricted. The lens is supplied with a macro attachment that will allow for unsurpassed close up photography. 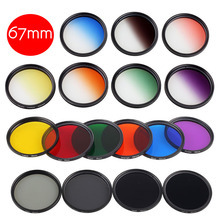 This Professional 0.5x Digital Wide Angle Converter Lens with Macro features high definition glass optics that is coated to reduce reflections and flare. These elements are housed in an all-titanium barrel that will stand up to years of use. Includes a 10 Year USA Warranty. Made in Japan. Lens Arrives With Either Blue Or Red Piping! KIT INCLUDES 9 PRODUCTS -- All BRAND NEW Items with all Manufacturer-supplied Accessories + Full USA Warranties:. Precision Design FA-DC67A Adapter Ring (67mm) +  PD 2.5x Tele & .45x Wide Lens +. 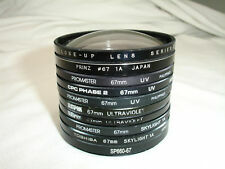 67mm (UV/CPL/ND8) Filters +  PD 50" Compact Travel Tripod +. 67mm Pro Hard Lens Hood +  PD-C20 Camera / Camcorder Case +. PD 5pc Complete Cleaning Kit +  PD Spudz Microfiber Cloth +  67-58mm Step-Down Adapter Ring. 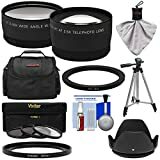 Kit includes:♦ 1) Precision Design FA-DC67A Adapter Ring (67mm)♦ 2) Precision Design 2.5x Telephoto & .45x Wide-Angle Lenses (49mm/52mm/55mm/58mm)♦ 3) Vivitar 3-Piece Multi-Coated HD Filter Set (67mm UV/CPL/ND8)♦ 4) Precision Design 50" PD-50PVTR Compact Tripod♦ 5) 67mm Pro Tulip Hard Lens Hood♦ 6) Precision Design PD-C20 Digital Camera Case♦ 7) Precision Design 5-Piece Camera & Lens Cleaning Kit♦ 8) Precision Design Spudz Microfiber Cloth♦ 9) Precision Design 67-58mm Step-Down Adapter RingThis adapter ring provides a 67mm threaded mount for adding auxiliary lenses, hoods or filters to the front of your compatible Canon PowerShot. Attaches via bayonet mount.This 2.5x Telephoto & .45x Wide-Angle Lens Set extends your wide angle, telephoto and macro capabilities, while maintaining the autofocus and auto exposure operations of your camera. 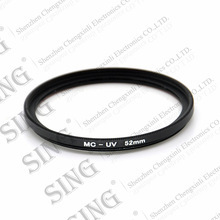 Fits the following filter mounts: 49mm, 52mm, 55mm, 58mm. Works best with standard focal length lenses (such as 18-55mm kit lenses).This Vivitar 3-Piece Multi-Coated HD Filter Set contains a variety of multi-coated glass filters that will optimize your photography experience, and protect your lenses from scratches and dust. Includes UV (ultraviolet), CPL (circular polarizer), ND8 (neutral density) filters and filter case.Lightweight and sturdy, this Precision Design 50-inch Compact Tripod is ideal for keeping your camera steady in nearly any location, allowing you to capture crisp, clear, steady images with ease.The Pro Hard Lens Hood is designed to prevent unwanted stray light from entering the lens, and protects the front of your lens from accidental impact.This Precision Design PD-C20 carrying case includes a zippered main compartment with padded adjustable divider, two exterior zippered pockets and two mesh pockets to securely hold your equipment.